Show & Tell will be at 10. 2016 Challenge packs will be available after Show & Tell. Want to present a future demo? Please email Jennifer! 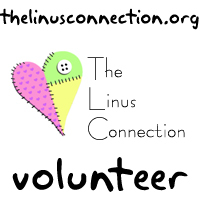 The Stitching Studio invites Linus volunteers on the second and fourth Wednesday of each month, 1 - 4:30, for Charity Sewing. Work on your charity project with no studio cost. Linus Kits will be available. Quilt Kits will be provided. Knitters & Crocheters Welcome. Bring your lunch. Support The Linus Connection simply by shopping at Amazon! Start at smile.amazon.com each time you shop. 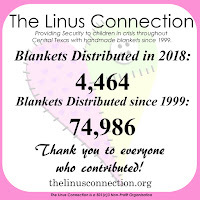 On your first visit, choose "The Linus Connection" as your charity.Your purchases will help support our awesome non-profit! It's time for camp blankets! During Camp Quilt collection, we will continue to provide quilts, yarn and fleece blankets for distribution to our usual recipient other facilities. Thank you to everyone that donates every month and for helping to make camp quilt donations possible! Marge & Jan talk about Christ Child Society. to include in bags filled for new parents. Complete blanket requirements are here. Please remember: Paper Tags should include your first name at the top. 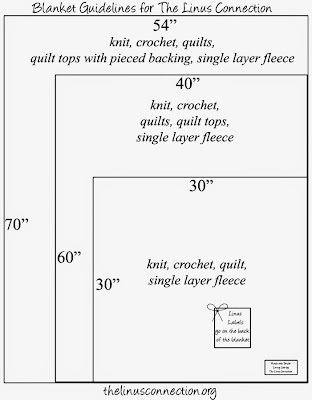 ALL blankets should include a paper tag and a sew on label (see diagram above). To qualify to order “Charitable Batting” from Hobbs Bonded Fibers, we are required to provide UPC labels from Hobbs packaged batting. 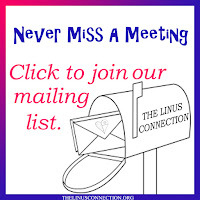 If you are a quilter or know any quilters, please save your Hobbs UPC labels and either bring them to the monthly meeting or mail them to us at The Linus Connection, P.O. Box 29491, Austin, Texas 78755. We need 5 UPC labels for each roll of charity batting we purchase and every label counts! Our volunteers make hundreds of blankets each month to meet the need of children in crisis in Central Texas. To do this, many supplies are needed. We are constantly in need of washable 100% acrylic yarn. Leftovers to full skeins are gratefully accepted. 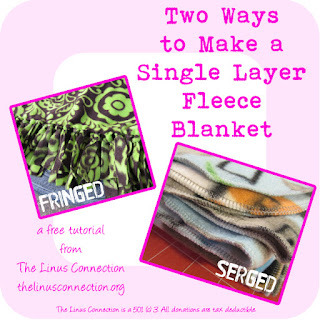 All fleece blankets should be SINGLE LAYER and fall within our size guidelines. Click here to learn more. June 2016 - No Demo - Handing Out Challenge Kits! July 2016 - Layer Cake Lemonade Variation by Sherly K.
We are always in need of volunteers for Demos. If you have a technique, pattern, etc, you'd like to share with our group, please email Jennifer to schedule your demo! Blankets were shown and donated on Saturday May 21, 2016. They are not necessarily being shown by the person that made them. Only a sampling of donated blankets is shown each month.